The family of Rick Martin and the Buffalo Sabres have announced there will be a public memorial on Thursday, March 24th at 11:00am at HSBC Arena. I am so glad they are doing this. Not only was Rick Martin an amazing hockey player, but a wonderful human being. 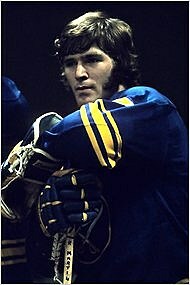 Buffalonians have been so blessed to have had this guy part of of hockey team and our community. Please keep Rick's wife Mikey and their two sons in your thoughts and prayers. Read more about the memorial to Rico by clicking here.